I like grand old houses, their craftsmanship, their whimsy, their attention to detail. A fine house can charm the senses and even, on occasion, uplift the soul. But best of all is when a house has a story to tell. 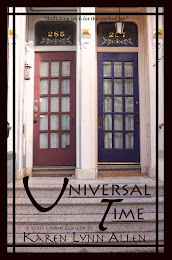 Often a century or two of renovations muddy the narrative or even lose the storyline altogether in favor of central air and indoor plumbing--modern conveniences that are understandable enough, I admit. However, to my delight, in Charleston, South Carolina, there exists a house where the whispers of history are abundant, where layers of generation upon generation are still plainly in view. It is a house that depicts the rise and fall not only of a family but of an entire civilization. It is the Aiken-Rhett house. 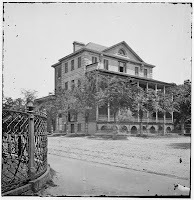 The house was built by Charleston merchant John Robinson who, with the fickleness of early nineteenth century fortunes, lost it soon afterwards. It was then bought by William Aiken, Sr., a prosperous Irish merchant, to be used as rental property. 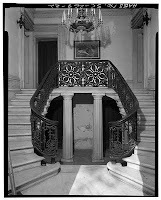 (Pretty grand rental property, even back then!) When Aiken Sr. died in a carriage accident (notice a theme of reversals?) the house was left to his son, William Aiken, Jr. He promptly moved in with his bride, Harriet Lowndes, the beautiful and well-educated daughter of a South Carolina political grandee. She spoke four languages and was destined to become one of Charleston’s leading hostesses. This son of an immigrant had truly made his way into Charleston society. Time for renovations! The house was expanded and upgraded into one of the most magnificent residences in Charleston, a city not lacking in resplendent abodes. Aiken himself became a big cheese not only in Charleston, but the entire state, elected both governor of South Carolina in 1844 and a member of Congress in 1851. 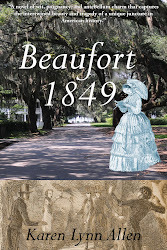 Owner of a number of plantations, he was also one of the largest slaveholders in the state. 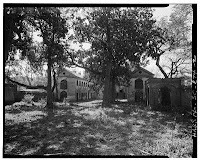 At the back of the Charleston house were outbuildings where the ten to twenty house slaves that worked there during the antebellum years could often be found—in the kitchen, laundry, stables, carriage house, and in their living quarters in the upper parts of these buildings. In the 1850’s the price of cotton went sky-high. Time for more renovations! 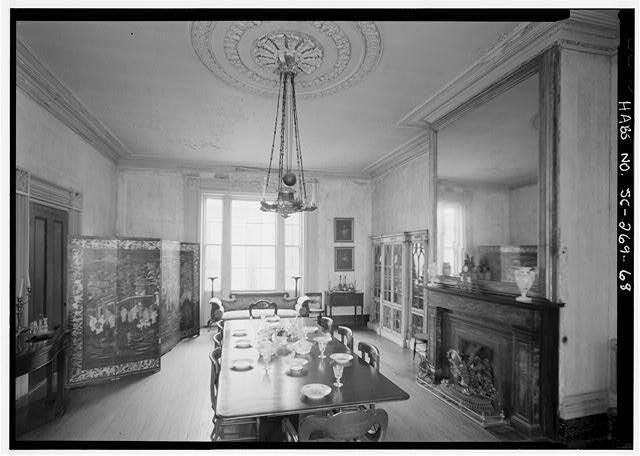 The interior was redecorated and an art gallery was constructed for the collection of paintings and sculptures that the Aiken’s brought back from their extensive tour of Europe. We’ve ridden the roller coaster of history up for the Aiken-Rhett house. Fasten your seatbelts for the ride down. Though a slave owner, Aiken was a Unionist and did not support secession. However, like most Southerners, after Fort Sumter he supported the Confederacy, tying the fate of his family to Confederate fortunes. 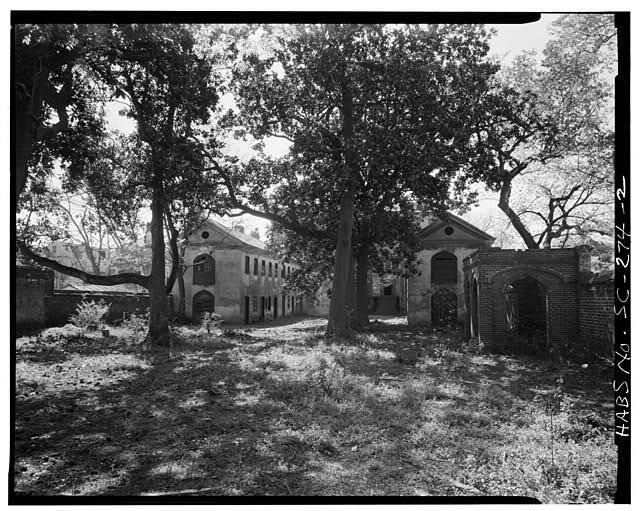 During the bombardment of Charleston, many of the grand houses were pounded into rubble, but this house escaped due to its placement further up Charleston’s slender peninsula. However, when Charleston fell to Union forces in 1865 the house was looted and Aiken arrested and taken to Washington for trial. He was later released due to the intervention of northern politicians he’d made friends with during his political heyday. Though their house had been looted, abused, and most of its valuables stolen, the Aiken family managed not to lose their home to federal taxes like so many in Beaufort did. They hung on and stayed on, as did most of the old families in Charleston. Too poor to paint and too proud to whitewash, as the saying goes. 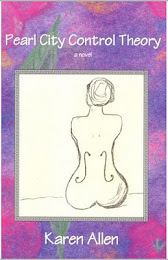 In the Aiken’s case, this meant wallpaper peeled, and carpets grew threadbare. It meant fabrics and plaster began to disintegrate, and in some places dry rot set in. With little money for wood or coal to heat large spaces, grand rooms were shut up entirely. It meant multiple generations lived together, paying expenses as best they could. 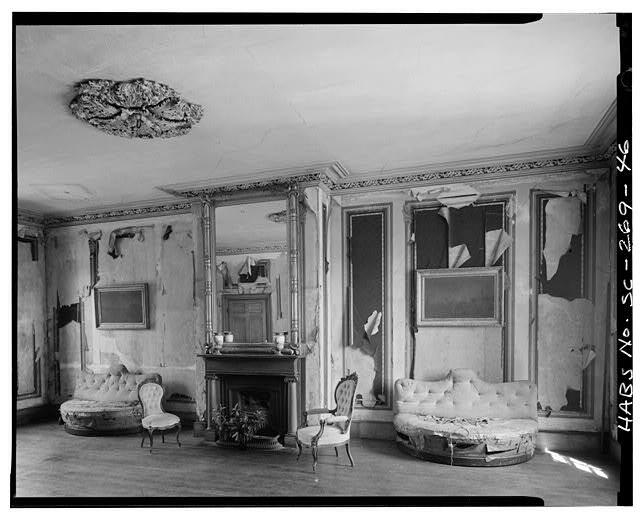 Harriet Lowndes Aiken lived in the house until her death in 1892, the grand ballroom becoming her bedroom. Her daughter, Harriet, and her son-in-law Major A.B. Rhett raised their five children in that house. Their descendants occupied it until 1975. Over the course of a hundred and fifteen years, remarkably few alterations were made. Electric lights were bought to some rooms. Heating panels were added to the dining room. The slave quarters were left nearly untouched. 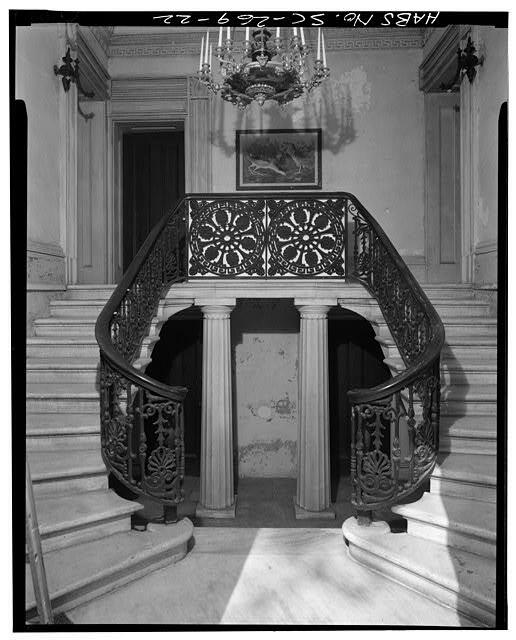 The brilliance of the Historic Charleston Foundation that now owns the house was its choice not to restore the house according to one period or another of its long history. 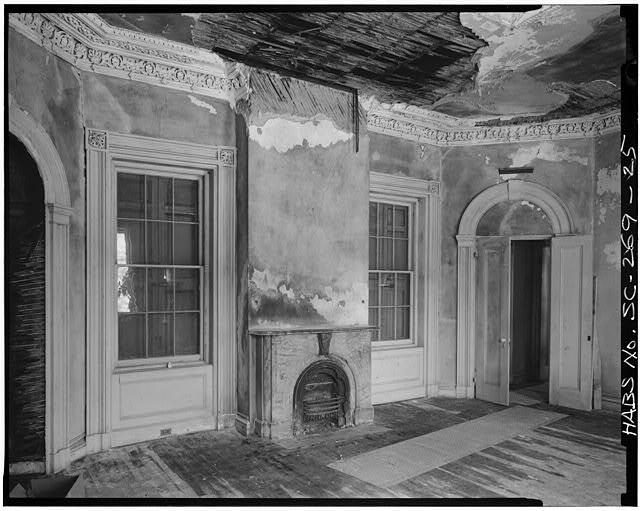 Instead, with one or two exceptions, they’ve preserved the house just as it was when they received it, in all its decaying grandeur. Walking through the grand double parlor with its fragments of wallpaper and full-length portrait of Harriet Lowndes Aiken, we sense the soirees to which the fashionable elite of Charleston flocked. Waltzes echo in the mirrored ballroom; on the piazzas we almost glimpse the young ladies in wide skirts laughing with their beaux. In the dank basement warming-kitchen, we sense the constrained lives of the slaves; in their painted and plastered living quarters in the outbuildings, we discern the slaves’ hierarchy in status as well as their chance for privacy and camaraderie. We can even admire the pleasant life the Aiken horses must have led in their rather elaborate stables. And then we feel the years rain down on the impoverished household, taking their toll in roof shingles and rooms left purposely shut up and untouched. Even in its last stages of decay, the dining room still must have been grand. And even as plaster fell and gardens became riddled with weeds, the Aiken-Rhett family clung to the house out of survival and proud testament to what once was. Like a ballgown found moldering in the attic the Aiken-Rhett house conveys more in its shambles than a reproduction would in pristine counterfeit. It tells us that as a civilization prospers, so do its dwellings. And after that civilization collapses, the buildings are often all that remain, silent narrators of a story distant and sad, whispering to us from across the centuries as the roller coaster of history glides on. 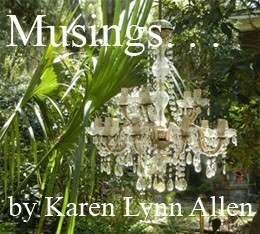 My wife and I toured the Aiken-Rhett House in May of 2012. The feeling we got when walking through the home wasn't a sense of awe or envy but of sadness and pity. The house deserves more than preservation. Even if it isn't restored and returned to a specific period of its history, it does deserve at least a bath and some make-up.